Firstly, I just want to make clear that I have always preferred indie movies rather than big budget holly-booed movies. It’s just a matter of content. Secondly, I’ll have to admit that all indie movies share some common features. Most of them are unconventional portrayals of unconventional people and situations, usually dealing with topics that are often marginalized or judged in real life. Things such as drugs, drags, homosexuality (or sexuality in general), death and dysfunctional families are on the top 10 of the most common topics discussed in indie movies. And I just love the fact that they’re so fucked up. Few people that I know like them, they argue that they are slow movies full of “people crying and shouting at the same time”, and because I chose the drama genre, that’s my logical argument when I have to say the reason I enjoy them so much. I’m not heartless and I don’t like it when people are in pain but I do think that a dose of reality is good from time to time. And that’s what most indie movies tend to give you. They are emotional and tender and they actually have a meaning. However, apart from the fucked up content they all have, given that there is no drama without comedy, indie movies have a really smart and corrosive humor that spits on your face when you least expect it. For me, that combination works pretty damn well. Why am I talking about that? Because (of) the kids are all right. This touching movie has all the elements described above. Partly-based on director Lisa Cholodenko’s own real-life experience, the movie talks about a couple of homosexual women, played by the award winning Annette Bening and Julianne Moore, who have two kids (the boy, Laser, and the girl, Joni). When these two are all grown up, they decide to find the sperm donor (Mark Ruffalo) who made their lives possible. Obviously, the two moms are not thrilled at all about that. The core of the movie is the relationship between these five people and how they go through the difficulties that arise along the way. In the first half of the movie, we have on one hand the lesbian couple trying to raise their kids properly while figuring out what is the right thing to do. On the other hand, we have Mark Ruffalo’s character and his biological two children getting to know each other while pretending to have a kind of paternal relationship. The two women, Nic (Annette) and Jules (Moore), are introduced to us as a strong and loving couple but obviously, all that glitters is not gold. They are far from having a perfect relationship (who isn’t?) but still, they are committed to each other. Meanwhile, Paul (a.k.a. Ruffalo) receives a call from the sperm donation bank asking him if he’d be up to meet his biological children. If he said no, this movie wouldn’t even exist so you already know what happened here. You can feel the awkwardness of their first meeting and there really are plenty of hilarious lines, from both of the parts. Well, the movie itself is full of funny and smart lines, so it is really easy and nice to be there for almost two hours. The scene that will change the relationship between Nic and Jules comes in a really enjoyable way. Their son, Laser, has been acting suspiciously (because of the guilt he feels for having met his biological father without his’ moms permission) and they start interrogating him (I won’t reveal anything of this because it is one of the brightest moments the movie has, in my opinion). The Q&A session leads to the big revelation which is that the kids already know their father. As a result, Nic and Jules decide to organize a meeting with Paul. From now on, we enter the second part of the movie. At this point, we get a deeper glimpse into the relationship of the main couple: we start suspecting of Bening’s character alcoholism and we see the both of them as a little frustrated (sexually and non-sexually speaking). While Jules isn’t really glad about the idea of the kids knowing their father, she lets them be with him and neither worries too much nor overprotects them. However, Nic is more narrow-minded than Jules and acts the opposite way: she starts controlling them and overprotecting them, leading to tense situations between all the members of this particular family. She does not really approve Paul and starts obsessing with the idea that he will steal her kids. Somewhere between all this mess, these women (at least one of them) start to feel disconnected with one and other and when they realize that, it is a little too late. I want this to have the least possible spoilers so I won’t explain what goes next, let me just say that although the rhythm declines a little bit and that there is not so much going on, the main plot remains being powerful, interesting and definitely recognizable by tones and tones of viewers. Forgiveness is something we deal with in a daily basis and whether we like it or not, it is not an easy task to forgive the unforgivable. Let’s talk about the acting for a moment. Julianne Moore and Annette Bening provide brilliant performances and they totally deserved the critical acclaim they got for their respective parts in this movie. Mark Ruffalo does a good job as well but clearly inferior to the one the leading women do. Alice in wonderland star Mia Wasikowska also does a very convincing and emotive interpretation as Joni (the daughter). Particularly, her finest moments in this movie come from the last 15 minutes or so, she totally pulled that role off! The least known actor, Josh Hutcherson, plays the part of Laser, the son and one of the most comedic characters of the movie. He is convincing and he sure has got talent but the lack of emotionally charged scenes involving him may just be the reason why we expected more from him. He is great though, and I mean it! 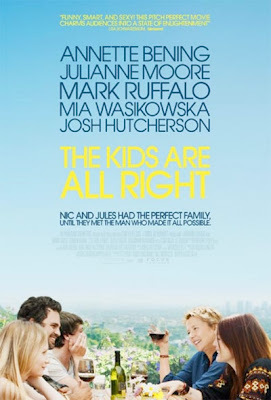 "The kids are all right" is an optimistic movie about a normal-modern family who has to face the complications and challenges most of the families (and marriages) have to deal with. Curious teens starting to revel against their parents, the importance of letting your kids grow up, helping your kids find their own identity and the fact that all relationships need constant work to maintain them healthy and all right are topics deeply discussed in this film. Finally, I’d say that although at the beginning of the movie (and maybe throughout all of it) the title can seem ironic to most people, the truth is that it is not only a title; it is the leit-motive of the film, because the kids are not all right. They are not even close. The director uses it as the key for this story, making it evident that the movie itself is a spiritual voyage in which its characters may find the internal peace once they figure out who they are and what they want in order to be all right.